A Face in the Sand - See Glass? Sea Glass. Well, you can see what Lin and I do to relax at home. Yep, we like taking our sea glass and other beach finds and making funny faces with them. Usually, these funny faces only last a short time, so I clicked this one before it was disarranged. It's not what you'd call artistic, but has a certain flair to it. I dunno. French? I guess if you messed around, you could actually do a Picasso type of a face. An eye in the forehead, one in the chin? Even if a Picasso you're not, when you're hot, you're hot. Face it. 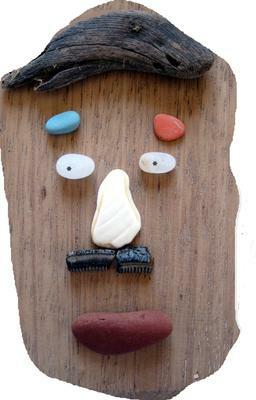 Face on the beach on the driftwood on the counter in the kitchen. Sea glass, driftwood, beach ceramics and pottery, who knows? I know we have put together better ones than this, so I'm going to make sure I get some snapshots before the genius is no longer. Do you have any faces you could share? OH! Be sure to "like" this page! Impress your friends!